1 Eanáir – Ghlac an Laitvia an tEoró mar airgeadra oifigiúil. Feabhra-Leanúnach - Thosaigh an eipidéim víreas Ebola san Afraic, ag galrú níos mó ná 18,000 duine agus ag marú ar a laghad 6,000 daoine. 7 Feabhra – Osclaíodh na 22ú hOilimpeacha Geimhridh i Sochi, Cónaidhm na Rúise. 13 Feabhra - D'éirigh An Bheilg ina chéad tír chun eotanáis dhleathach a cheadú. 28 Feabhra – Tháinig deireadh leis na 22ú hOilimpeacha Geimhridh in Sochi. 5 Márta - Bhris Nicolás Maduro, uachtarán Veiniséala, naisc thaidhleoireachta agus polaitiúla le Panama, ag cásadh le Panama comhcheilg i gcoinne an rialtais Veiniséalaigh. 8 Márta - Chuaigh Eitilt 370 Aerlíne na Malaeisia, aerthárach faoi bhealach go Béising ó Kuala Lumpur as ramharc agus é ag dul thar Murascaill na Téalainne le 239 duine ar bord. Meastar gur thuairteáil an t-aerthárach isteach san Aigéan Indiach. 15 Márta – Bhuaigh Éire Comórtas na Sé Náisiún (rugbaí). 16 Márta - Tionóladh reifreann ar stádas na Crimé. 10 Bealtaine – Bhuaigh Conchita Wurst as an Ostair Comórtas Amhránaíochta na hEoraifíse leis an amhrán Rise Like a Phoenix. 28 Bealtaine – D'éirigh Éamon Mac Giollamóir mar cheannaire Pháirtí an Lucht Oibre. Bealtaine – Tuilte in Oirdheisceart na hEorpa. 12 Meitheamh – 13 Iúil – Corn FIFA an Domhain 2014 ar siúl sa Bhrasaíl. Bhuaigh An Ghearmáin an comórtas. 19 Meitheamh – D'éirígh Rí Juan Carlos I na Spáinne as i bhfabhar a mhic Felipe VI. 8 Iúil – Chuir an rialtas Iosraelach tús le "Operation Protective Edge", ionsaí ar an Stráice Gaza. Lámhaíodh eitleán Malaeisiach (Malaysia Airlines Flight 17) síos san Úcráin. Fágadh 298 daoine marbh. Lean an chorraíl ar aghaidh sa Phalaistín mar gheall ar an ionsaí talún i nGaza. An Bolcán Bárðarbunga agus é ag briseadh amach ar 4 Meán Fómhair 2014 san Íoslainn. 3 Samhain – hOsclaíodh One World Trade Center i gNua-Eabhrac. 12 Samhain – Thuirling Philae, taiscéalaí ón spásárthach Rosetta ar an gcoiméad 67P, an chéad uair a rinneadh árthach a chur ar choiméad. 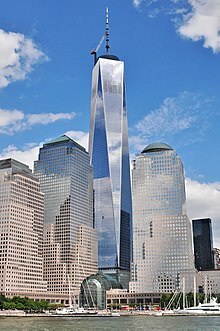 Is é One World Trade Center, a osclaíodh i mí na Samhna, 2014, an foirgneamh is airde sa leathchruinne thiar. 7 Feabhra–28 Feabhra – Thóg Cluichí Oilimpeacha an Gheimhridh 2014 ar siúl in Sochi, Cónaidhm na Rúise. 12 Meitheamh – Thosaigh Corn FIFA an Domhain 2014 ar siúl sa Bhrasaíl. Bhuaigh an Ghearmáin an comórtas. 13 Iúil – Bhuaigh an Ghearmáin Corn FIFA an Domhain 2014. 4 Meán Fómhair – Bhuaigh Ciarrai Craobh Shinsear Peile na hÉireann. 4 Meán Fómhair – Bhuaigh Cill Chainnigh Craobh Shinsear Iomána na hÉireann.